For those not familiar, there is a website (actually a few of them) that is a cross between the stock market and a gambling website. It’s called Intrade. Basically, the way it works is they are an electronic exchange for buying and selling shares of different events. One event that is particularly popular is the Presidential Election. The site shows how ‘trading’ is going at the Electoral College level and the popular vote. Obama is ahead 364/174 in Electoral Votes and a 93% chance of winning. I really like this site as an indicator how the election is going. It’s been a place I’ve turned all election season for a calibration of the races. What I really like is the agreement between ‘investors’ to find the equilibrium in the chances of a candidate winning a state. I believe investors are probably the most accurate predictors of the future outcome and the significant number of investors should do a good job of focusing to a reasonable percentage. In fact, some of the aggregate pollsters use the results of Intrade to help determine the outcome of their polls. The stock market sensitivity to events is usually extremely fine and relatively accurate as to where the economy or world events are going. The Electronic Market extension (as is Intrade is considered) is a great way for cutting through Parisian rhetoric and getting to a real idea as to where the election stands. I don’t have the stats from four years ago, but I believe the site was relatively accurate. As the day and night drag on, I would suggest popping over to Intrade to see how they are projecting the different states. Well, the most obvious thing to notice over the last two days is the increase in support for both candidates. This makes sense as you’d expect some of the undecideds to quickly begin focusing in on their choice. While the movement was nominal away from the undecided column (only .5%), the perceived trends continues with McCain picking up a larger share of that support. McCain picked up 67% of the undecideds after picking up 56% yesterday. Keep in mind, with the minimal reduction of undecideds (pool for analysis is small), the support will fluctuate. Based on the latest polls and analysis, my election day prediction is that Obama will garner 50.7%, McCain 44.3%, Barr/Nader 5%. The best news is even if the undecideds break to McCain, Obama’s continued ability to remain over 50% really means that the undecideds will not affect the popular vote winner. Keep in mind, the biggest flaws in the polls is that they continue to measure against a two candidate race. The third parties will garner 3-5% of the vote overall. I continue to believe Barr is a more serious threat to McCain than Nader is to Obama. The Real Clear Politics averages back that theory up. I supect there will be a net -1% affect to McCain. McCain’s got one day to make up 6%. I do not think that’s going to happen. Looking at the Electoral College, Obama lost a little support for the seventh of eight days. All pollsters remained relatively stable except for FiveThirtyEight.com. Nate Silver reduced his estimate from 344 down to 332. However, based on the latest polls and projections and some analysis I’ve done via Pollster.com, I believe the final Electoral total will be much closer than most aggregators are predicting. My final count now is Obama 291, McCain 247. Why the big change from yesterday? I’ve moved Ohio and Florida back to McCain. Remember yesterday when my gut told me that those may not go for Obama? Well after further analysis and thought, I believe they will be going to McCain. I had a good conversation back and forth with Sam Wang from The Princeton via his comments section today. I pointed to the fact that these aggregate models are great, but too much focus is put on the quantitative aspects and not enough on the qualitative. I’d like to think to get ahead of curve here because we’ve been able to put an analytical spin on the metrics. This is the same methodology I use in my ‘day job’ to analysis Earned Value metrics. These candidate polls are all lagging indicators, I’ve always believed you need a little qualitative input to determine where things are going, when you are predicting the future. This decision was as much a quantitative as qualitative. Why did I make this change? First, the polls have been closing (some rapidly). In fact, if you turn up the sensitivity on the models from Pollster, the margins are very close. These states all went to Bush in 2004 and there is very little to show that these statistically insignificant leads will hold up for Obama. He may win one of them, but I am going to be conservative in my estimates. I also have questions with Virgina, as those polls have been closing too. However, there still a statistically significant lead for Obama and when pairing down the polls to the four or five with the best rep (leaving out Zogby), his lead is maintained. If you were to take Virginia away, Obama would still be at 278 over the 270 he needs. None of the other states appear to even be close. Of course, McCain continues to play hard in Pennsylvania and the polls are tightening. The difference in Pennsylvania and why I am not nearly as nervous, is Obama’s support is still at 51% and McCain has not been able to chip away from that number. McCain is picking up undecideds. He can pick up all the undecideds and still fall short. Two final points. First, I come from the school of being conservative. The point is to understand the chances that a particular candidate will win. This is a safe projection of the final tally. Why give Obama the benefit of the doubt in states that went to Bush in the last two elections, the polls have been closing, and we don’t know how a ‘Bradley Effect’ may affect the vote. Second, if Obama wins by the 6% projected here and in other polls, he will probably garner a lot more than the 291 EV’s. I still believe there is a slight disconnect between the popular vote and Electoral College. I tend to think the popular vote might be closer. I didn’t move my estimates, though, because there is no data to suggest the national polls are wrong. Again, if they are right, then Obama will probably clear 300 EV’s. I like Rove’s map because he puts the % that the candidates are up. You need 270 to win. McCain needs to win all the ‘yellow’ states and then pick off 41 more Electoral Votes. If he takes Pennsylvania – he’d still need to get Ohio. If he gets Ohio, but not PA, he’ll need to take Colorado, New Mexico and Nevada. He could also take Ohio, Virginia and Nevada. Here’s the problem, if the polls are correct, he is not going to make up 11 points in Pennsylvania. There is definitely a doable strategy for McCain – but he’s got to be perfect. He’s got nine or ten states he is either behind or tied that he needs to win. And in all the ‘toss-up’ states, except Montana, he is statistically insignificantly behind. How tough is it to win those states? 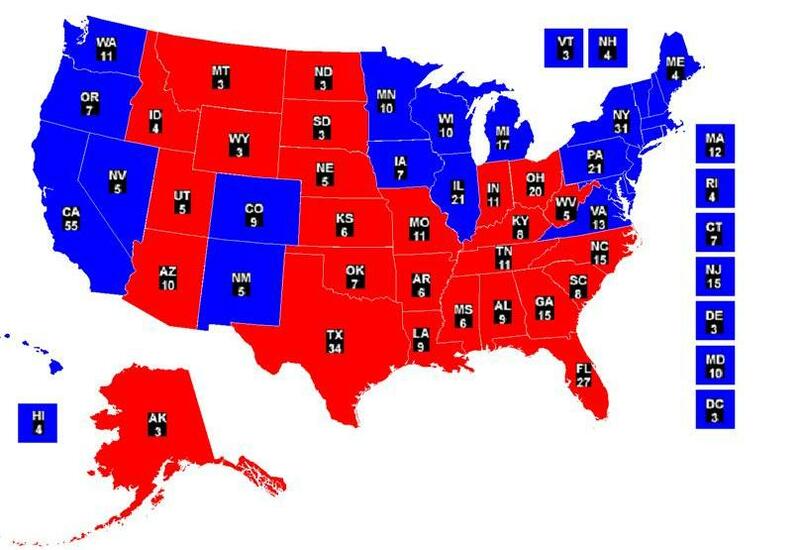 Rove’s map matches nearly everyone else’s – including Real Clear Politics (RCP). In 2004, the RCP map got only one state wrong in their prediction – Wisconsin. It went for Kerry when they had predicted Bush. More comparisons. In 2004, about a week out, the Electoral College was split 234 for Bush, and 211 for Kerry. McCain only has 157 in his column. In addition, in every single toss-up state (except Wisconsin), the candidate who was leading – no matter how slightly – won that state. The question you need to ask yourself is whether or not you believe the polls. Do you believe in a Bradley Effect? Do you not believe more Democrats will show up than in 2004? Do you believe that the youth and African American population will increase? If you do, then the race is over. If you don’t, then it still is going to be tight. There has been an explosion of polls this presidential election. Through yesterday, there have been 728 national polls with head-to-head matchups of the candidates, 215 in October alone. In 2004, there were just 239 matchup polls, with 67 of those in October. At this rate, there may be almost as many national polls in October of 2008 as there were during the entire year in 2004. There are two factors that tend to have me believing the polls. The first is there are a lot more of them this year. We do not know the quality of them, as Karl Rove goes on to say in his article, but the fact is they all tend to be in alignment – somewhat. That is, the traditional pollsters who have good reputations are showing the same basic results as the new ones. At the National level – McCain has not led one poll in over a month. That’s 215 polls. Not one outlier shows McCain with a lead. Second, there is a little more variability in the state polls, but the outliers are at both extremes and if you go to the mean, I believe you got the right result. Look, if you have three pollsters who are doing the polling, there’s a good chane their methodology could be wrong. But when you have 15-20 pollsters in a state, this will reduce variability. We see some extremes in the state polls, but most are around what the mean ends up being. The second factor is I believe the pollsters are getting better. Polling is a science. The pollsters are learning from each other (e.g. cell phones, etc.) and improving the quality from mistakes they have made in previous elections. A ‘Dewey Wins’ banner will never again occur the same way it did in 1948 when they stopped polling a week out. They learned. They learned in 2000 and in 2004. Additionally, folks like Nate Silver and Sam Wang and Mark Blumenthal have made a science out of projections based on multiple polls. They’ve also helped keep pollsters honest and throwing out bad polls. Believing the polls are acurate, means I believe Obama will win this election. There are too many states that the pollsters would have to be wrong about for Obama to lose. It’s not like 2000 or 2004 when it was going to come down to 1 or 2 states. No, for McCain to win, it has to come down to 9 or 10 states. Thinking of how close Ohio and Florida (and New Mexico) were in the previous election cycles – it’s hard to believe that McCain would come out on the right side of all those close battles.